The second circular for the forthcoming 2013 International Congress of Speleology, to be held in the Czech Republic, has been released. This is an event that all cavers of any experience will enjoy, so head for the congress website to download a copy and find out the latest details. Descent (229). Jenny Potts, for DCA, has issued a warning that there are serious problems with carbon dioxide in Nettle Pot. A warning has been hung from the bolts under the lid and cavers are advised that they should stay away until the problem has been investigated and dealt with. Descent (228). Ralph Johnson has a set of Descent from issue (20) onwards to sell in aid of Derbyshire CRO. E-mail Ralph [link removed] for further details. Descent (228). In May 1952 some fifty or so cavers met at the George Hotel in Castleton and agreed to form the Derbyshire CRO. Initially, this was a fairly loose organisation relying on a card index callout system operated by the police and using club equipment, supplemented by some very basic kit owned by the Mountain Rescue Committee, kept in a doctor’s loft in Castleton. A handful of minor but successful rescues in the 1950s was followed by the stupendous but unsuccessful 1959 attempt to rescue Neil Moss from Peak Cavern. After this, the organisation was overhauled, reorganised and gradually grew into the DCRO of today, operating from its new base at Buxton fire station. In its sixty years DCRO has so far been called out on 356 occasions, going to the aid of over four hundred people and nearly fifty animals. Past and present team members and friends of the organisation will be celebrating its Diamond Jubilee in Hope at the end of September. If anyone with past connections with DCRO would like to attend please contact Clare Harley for details. Descent (227). Saturday 14 July saw the first through-trip from Boundary Pot to Wretched Rabbit in Ease Gill Caverns, joining Hiroshima and Nagasaki via the aptly named, newly opened Manhattan Connection. Sam Allshorn and Mike Cooper report that the link requires further work to make it safe, as it is currently very unstable. Descent (227). An interesting new document has been published by Natural England under the title of Managing Geological Specimen Collecting: Caves. As might be expected, this has a conservation-rich approach; copies of the pdf may be downloaded from Natural England. Descent (227). John Radburn has requested help to highlight a missing member of Lincoln CC, Jakub Gladski (known as Jay). 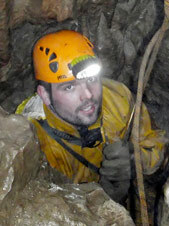 John writes that 2012 started well with a superb trip down Lathkill Head Cave in the Peak District and the group returned to Lincolnshire in jubilant mood. However, the next day, 2 January, Jakub picked up his caving gear from John and disappeared; a few days later his gear and wallet were found in his car in Skegness. Though there have been two unconfirmed sightings, he has not been heard from since. Jakub is 31 years old and described to be of stocky build, 5ft 10in tall, with hazel/brown eyes with a moustache and short dark brown hair – more details are available online via the Missing People website (the photo was taken during the Lathkill trip). There is concern for his safety and Jakub is urged to make contact by phone or e-mail through the organisation's confidential service. Descent (226). The dates and venue for the annual CHECC event have been confirmed as 9-11 November 2012 at Yoxter, near Priddy on Mendip. Descent (226). An International Congress of Speleology is held every four years; the next will be in Brno in the Czech Republic from 21 to 28 July 2013. The congress will, just as its forerunners, be organised around talks and workshops, films and competitions, but with a strong element of pre- and post-congress camps and caving excursions during the week-long event. Czech cavers and diggers are among the most motivated and best in the world; in this region you may experience a range of caves from stunningly easy but impressive tourist sites to some harder trips that might challenge even the best. The Moravian karst, the largest caving region in the country and near to Brno, contains more than 1,200 known caves and these are definitely not to be missed. State-of-the-art conference facilities have been booked in the centre of Brno. Bear in mind that the Czech karst is readily accessible from the UK, being only a little further than driving to the south of France. Whether you are looking for a great caving experience or simply wish to spend some time in this historic karst area, you should not pass up this opportunity. The organising committee has prepared the first circular, downloadable here, or head for the congress website for further information. A conference organised by the Cambrian Caving Council at Penderyn Community Centre was announced in Descent (225). Apart from the date of Saturday 26 May, no further details were available as the issue went to print, but these have now been released. The cost is £5 for the day, a subsidised price, but space is limited so it is essential to prebook your place by e-mail. Topics in the programme include first aid and self rescue, cave life, access and coinservation, basic underground photography and surveying, and the geology and hydrology of Welsh caves. The Sunday will see some additional underground workshops included in the price. Descent (225). The dates and venue for the annual Hidden Earth national caving conference have been finalised and the event will take place over the weekend of 21-23 September at Thomas Whitham Sixth Form in Burnley. Descent (225). Jenny Potts for DCA has posted notices concerning Nettle Pot and JH. At Nettle, Martyn Grayson reports that the two pull-throughs are no longer operative: the steel karabiners on one have worn through to almost half their thickness and the second has jammed (though a fixed rope has been installed to gain access to a dig). Both will be replaced as soon as possible using a cable and ring system. The report on White Nose Syndrome on p7 of Descent (224) can be updated with a new estimate for the number of bat deaths that have occurred in North America since the outbreak in the winter of 2006. The US Fish and Wildlife Service now places the fatalities at between 5.7 and 6.7 million (not including the current winter), upgrading this from the prior 2009 total of 1 million.